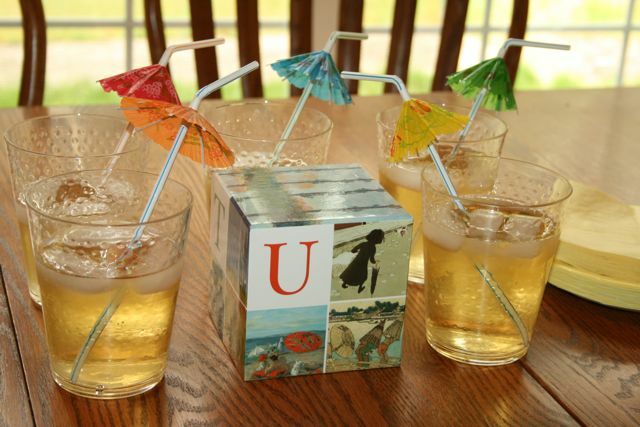 Looking back a couple weeks, here are some pictures from "U/V" week. I can't seem to find any of the girls completed coloring pages and worksheets for this week. I set them aside to photograph, and now I can't find them. . . It looks like I've developed a habit of hiding things from myself! The girls made the letter U & V with Modeling Wax , as well as some Umbrella's and Volcanoes. It looks like I forgot to take a picture though! They also colored the Vetch Fairy from the The Flower Fairies Alphabet Coloring Book and listened to A Flower Fairy Alphabet on CD. Here are our hand-painted saint dolls for with An Alphabet of Catholic Saints . 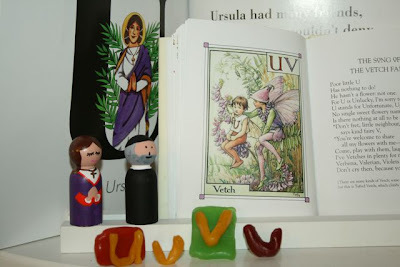 They also colored St. Ursula and St. Vincent Coloring Pages from Catholic Artworks and completed some copywork, which I created at Writing Wizard using the quotes from An Alphabet of Catholic Saints. We thought about making Vestments, but since I suggested this craft to Marci for her Summer with the Saints (which will start next month) we decided to wait. Museum ABC's pictures for the letter "U" are based on Umbrellas. 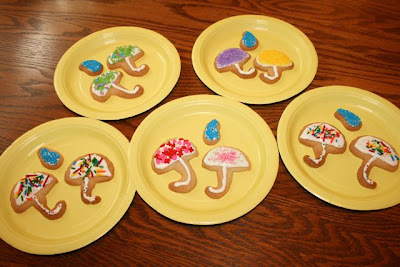 I pulled out the nesting blocks and the children drank juice with Umbrella straws and decorated Umbrella cookies, inspired by Amy. 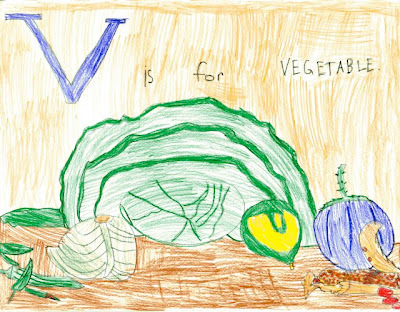 Rascal also did a picture study on vegetables using Museum ABC's book and nesting blocks . Since my boys had been studying Mars, and were planning to make Mons Olympus - the largest Volcano in the solar system - for Astronomy, I decided to have the girls study Volcanos as well this week. 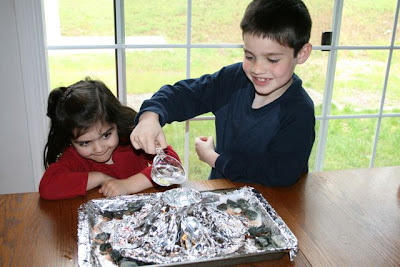 We added sound effects to a video clip of our volcano! 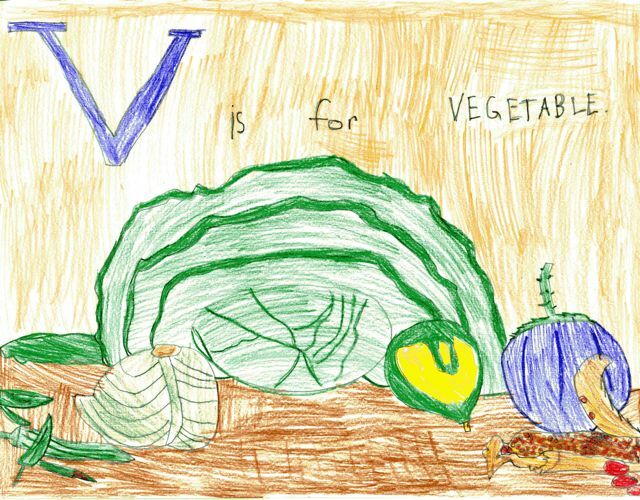 Since we've been enjoying lots of treats during our weekly Good Shepherd's Garden Parties, I am trying to choose mostly healthier "treats" as we finish up the Alphabet Path. 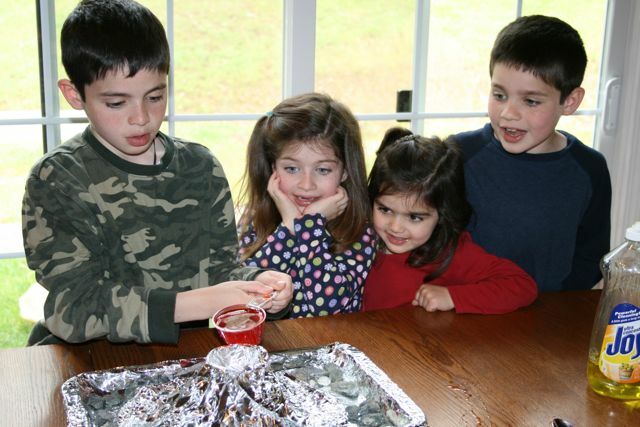 This week we snacked on Uncooked Vegetables and made Potato Veggie Volcanos (adapted from Big Snacks, Little Meals: After School, Dinnertime, Anytime ) since I had some broccoli that needed to be used up in the fridge. 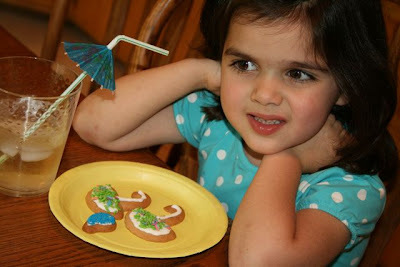 These were SO easy and such a hit with my children! All I did was place a "mountain" of hot mashed potatoes on top of some freshly steamed broccoli. 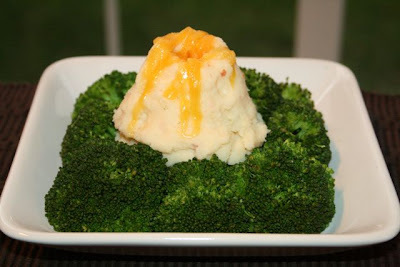 I then made a well in the top of the mashed potatoes for the opening of the volcano and then topped it with grated cheddar cheese, which quickly melted to look like lava flowing from the top of the volcano. We've since worked our way through "W" week and have moved on to "X/Y". It looks like me might be able to finish the Alphabet Path this year after all! I am loving the veggie volcano. I feel the same about all of the treats. I am going to try some more healthy creeative ideas in the future as well. I also love the healthy snack ideas, especially the mashed potato volcano. What a great idea! I have been quite inspired by all of your ideas, thank you so much for sharing all of them! I struggle with one area of homeschooling - organizing all of the supplies. May I ask you how you organize all of your supplies? AND How do you line up what you are doing each week? I am always looking for ways to improve, and it seems as though you must have a nice system in place. We are expecting our fourth child soon and I am getting a little nervous about how to get set for things to come. 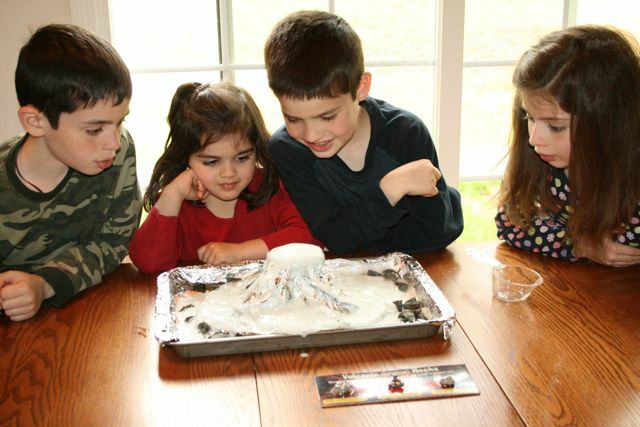 I LOVE the vegetable volcano! Sou brasileira e estava a procura de mães que vivam o que quero viver. Que linda e abençoada sua família. Eu moro no Rio de Janeiro, tenho 23 anos e estou noiva me casarei no próximo ano e pretendo ter também muitos filhos e cria-los em casa. Você aceitaria me enviar seu email, para que possamos conversar? Favor não aceitar este comentário. I also wanted to ask you to share some on what you do with snuggles while the others have more formal lessons? From the pictures it looks like he participates quite a good deal, but do you have any activities set aside for him? Also any thoughts to share about having littles (snuggles and rose) to occupy and take care of while instructing the older children. Girl your are so clever! Great job.....looks like total fun! You goodie got mailed out Tueday morning so the should be to you by Thursday or Friday. Give me a shout when you get your package! mispelled/type-o's....I sound like a total Hillbilly! I get in a hurry! 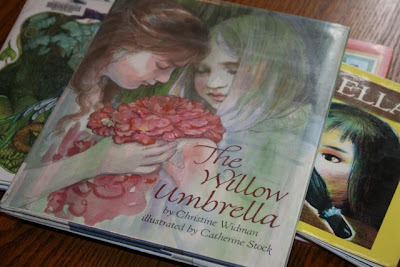 Jamie ~ I would have never been able to do it without the inspiration from Elizabeth Foss! I hope Angela enjoys it as much as my girls have!! 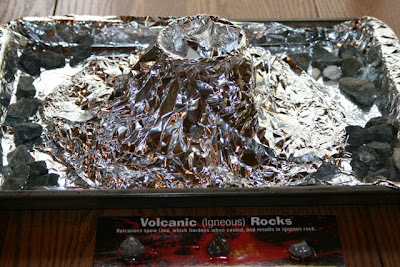 Robina ~ That you again for the simplified version for the volcano! Blair ~ I think it has more to do with that little baby you have on the way! Amy ~ I wish we had a Zoo around here and could do a field trip together. Wouldn't that be fun?! Sabrina~ I am sorry... I've been unable to translate your comment, but I will ask my Husband for help soon. Exspectantes ~ Yes, Snuggles does participate quite a bit. He also loves puzzles and watching Signing Time, which keeps him buys during some of our "formal lessons." I also have "School Time" Toys for my little ones which I posted about here. (lol! I just noticed my husband left a comment on that post which I don't remember seeing!) Personally I find it very hard to homeschool with lots of little ones (I dream about how nice it would be to hire someone to come in and help with the housework so I could focus completely on the babies and homeschooling), but it CAN be done and I believe that what we are doing (even if it's not done as well as I would like) is the best option for our children. Georgiann ~ Thank you!!! Oh, and I do the same thing when I leave comments! My friend's four year old son is obsessed with volcanoes right now. I am going to share the veggie volcano idea with her. He loves his veggies so I know he'll go for it. I would love to pass this Sunshine award on to you!